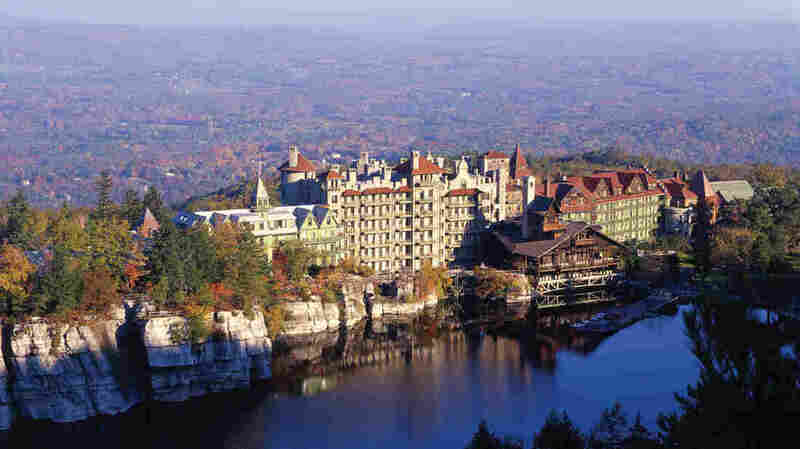 Stomach Bug Closes Landmark New York Resort : Shots - Health News The Mohonk Mountain House in New Paltz, N.Y., closed Friday afternoon so that cleaning crews from a company that specializes in disaster responses can scour the place after an outbreak of intestinal illness. Norovirus appears to be the culprit. Mohonk Mountain House, a resort 90 miles north of New York City, is closed while crews sanitize the facilities after an outbreak of gastrointestinal illness. Norovirus isn't just a problem for cruise ships. The Mohonk Mountain House, a historic resort on the edge of Catskills in New York, closed Friday afternoon so that cleaning crews from a company that specializes in disaster responses can scour the place after an outbreak of intestinal illness. The cleanup is expected to take a week. Hundreds of people, both guests and staff, were reportedly sickened in the last week or so. "Preliminary information indicates that the illness is consistent with norovirus," the New York State Department of Health tells Shots in an emailed statement. "Mohonk Mountain House has taken the proactive step to temporarily close their facilities. Professionals from a remediation company are on-site performing a thorough cleaning of the premises to help prevent transmission of the illness within their facilities." Earlier Friday, WABC-TV posted a note to Mohonk employees from resort president Bert Smiley that reads in part: "Over the course of the last few days, it has become increasingly clear to us that the virus that has caused illness among staff and guests is very persistent." New Norovirus Strain Rips Through The U.S.
Kyle Bonner, a 21-year-old graduate student at Monmouth University, and his partner were among the guests who got sick. They stayed at the resort last weekend, checking out Sunday morning. "I'm still not feeling well. I was sick all day Monday and Tuesday," he tells Shots. His partner was treated for dehydration at a hospital ER in New Jersey after they got home. "What bothers me the most is that there was a large conference a few days before we arrived and many of the participants contracted the same virus," Bonner wrote in a review on the website TripAdvisor. Quite a few attendees of a meeting of New York librarians and educators at the resort late last week got sick. Many made the best of it with on Twitter. You can read their accounts by searching for the evocative hashtag: #MoChunk. Bonner tells Shots that he didn't need to go to Mohonk last weekend. The resort should have told him and other guests that there was a "fast-moving virus" on the premises so they could have changed their plans, he says. The resort has never experienced anything like this before, she says. "We're very, very sad for our guests and the discomfort that happened here at Mohonk."